Happy Thanksgiving to all of you! Course 2 of Wilton’s Cake Decorating series concentrates more on flowers and especially flowers made with royal icing. What is different about royal icing? Royal icing does not use any fat (butter/shortening). It’s just a combination of confectioner’s sugar, meringue powder and water. Unlike buttercream icing, royal icing creates hard-drying and long lasting decorations. This means you can make these decorations ahead of time (even months ahead) and simply place them on your cake. Another interesting feature of royal icing decorations is that it will not soften or crumble when stored properly. It should not be kept in bright light, as colors can fade. Just like buttercream icing, consistency of royal icing is very important. Another item used in royal icing decorations is the Color Flow mix. This again has egg whites posing a problem to vegetarians and vegans. 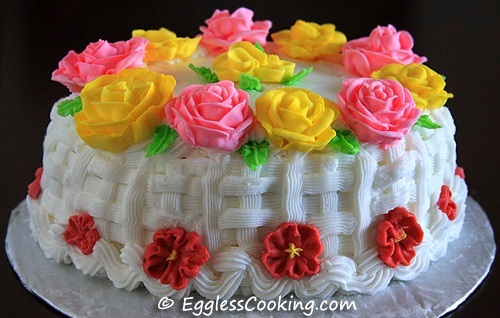 I was searching the net for egg-free royal icing recipes and spotted few but was not sure how it would work. One of my classmates mentioned that her vegetarian friend used cream of tartar to replace the meringue powder. I couldn’t decide which one to choose. Luckily I found a vegan royal icing mix in the store (Bulk Barn) I take the course. It’s just icing sugar and soy protein and I had to simply add a 1/4 cup of water and beat it well. It’s from a company called Liberty Sugar Decorations Inc. You can find such mixes online too. I have not tried this brand. The brand of royal icing mix I bought worked very well. The roses I made were as good as the ones made by others. I also omitted the Color Flow mix while filling a few decorations and that turned out good too. Is royal icing better or buttercream icing? 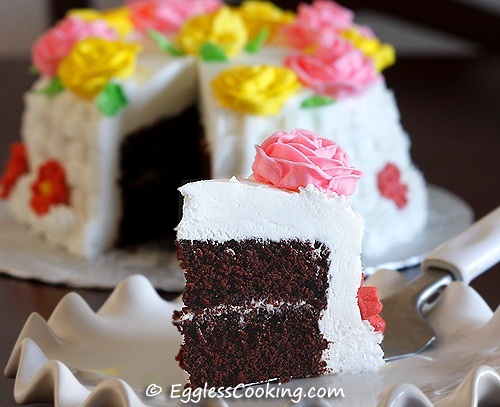 Since royal icing hardens it cannot be used to frost on cakes, even though it is edible. It is used as a glue while making gingerbread houses, decorated on cookies and for other long lasting decorations. Taste-wise buttercream icing gets my vote, but if you want to have a spectacular visual presentation royal icing is good. I didn’t like the taste of the flowers I made, it is just hardened sugar. Of course, children can’t get enough of this. Another important thing to note is royal icing is high maintenance. The tips, decorating bags, the bowl in which you prepare the icing, the mixers and anything that comes in contact with royal icing has to be very clean and grease free. There is no excuse for this at all because even the slightest amount of grease will affect the texture of the royal icing and you won’t be successful. So it is advised to have a separate set of tips, containers etc for preparing royal icing. If you use the same stuff you use for buttercream icing and don’t clean it well the fat from this icing will affect the royal icing. So use a dishwasher and my instructor also suggested cleaning the tips, etc with vinegar before using it with royal icing. 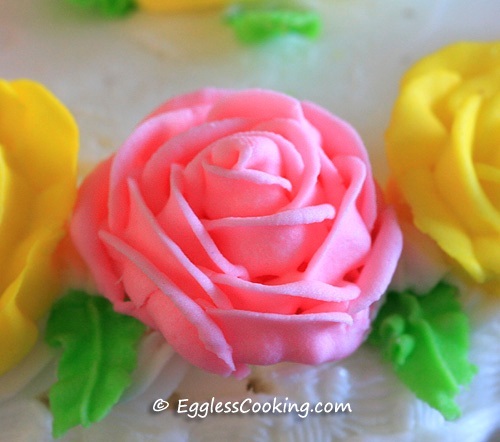 Victorian Rose: Similar to the buttercream icing roses, but you would be using royal icing instead. Also tips 97 (right handed) or 103 (left handed) is used instead of 104. 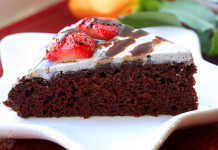 You would be surprised to know that this chocolate cake is vegan and made with barley flour. Preheat the oven at 350F/180C for 15 minutes. Grease the pan lightly with non-stick cooking spray and line the bottom and sides of the pan with parchment paper. Sift the barley flour and stir together rest of the dry ingredients (sugar to cocoa powder) and create a well in the center. To the well add all the wet ingredients one by one. Mix until just combined. Don’t over mix. It’s OK to have some lumps. Pour the batter in the prepared pan and bake for 25-30 minutes or until a toothpick inserted into center comes out clean. Mine was done by 27 minutes. If baking cupcakes, check around 13-15th minute. Transfer the pan to a wire rack and let it cool for 15 minutes. Remove the parchment paper on the sides of the pan and slowly invert the pan on a plate and the cake comes out perfect without sticking to the pan. I was crossing my fingers while the cake was baking. Though I did see a couple of recipes for chocolate cake using barley flour, I was not sure how this one will bake because I was not using eggs, unlike the other recipes. I have read that barley flour is not as glutenous as all-purpose flour or whole wheat flour. So I was absolutely surprised to see the cake because it had risen perfectly. I couldn’t wait to taste the cake. Once I tasted the cake I was literally jumping in joy because it was very good. It didn’t smell raw or it did not taste bitter or it did not have the grittiness of whole wheat flour. Of course, it did not replicate the taste of all-purpose flour but it was definitely good and way better than using whole wheat flour. So I think those who don’t like the taste of whole wheat flour in baked goods can start experimenting with whole barley flour instead. I felt the cake was not sweet enough when I tasted it a couple of hours after baking but from the next day onwards I did not feel that. The sweetness was just right. I had to bake 2 layers of cake for my class. Since I was not sure if the cake would come out well using barley flour, I tried just one layer first. 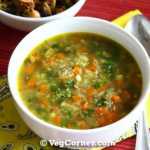 I simply stirred together the dry ingredients and proceeded as mentioned in the recipe. 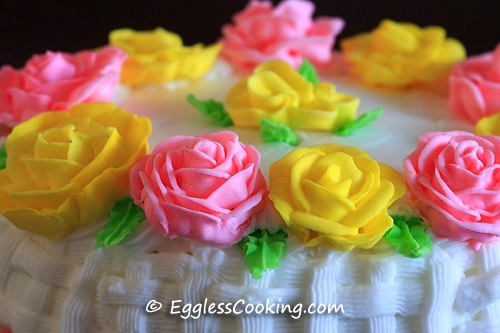 The cake rose beautifully just like the one I baked with all-purpose flour. I was able to see some unprocessed husks of the barley. So while baking the next layer I sifted the barley flour. I don’t think we will be losing nutrition because of this since the residue on the sieve was very less. Sorry I wanted to ask about baking powder not soda.You have not used it in this recipe.. I was wondering that the texture will be a like a dense cake and not airy. Baking powder is not required in this recipe, Bhaavi. We are using vinegar so the cake will have a light texture. Hi.. I am planning to try out this recipe.. I have two doubts before I can try: one, why there is no baking soda in this recipe?and second, vinegar is working as a egg replacer here I believe.. but what other egg replacer I can use here? In other words how do decide which egg substitute goes with which recipe? There is baking soda in the recipe, Bhaavi. It’s the 4th item on the list. 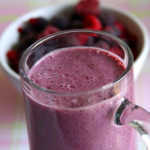 1/4 cup of yogurt will work too in this recipe. As to which egg substitute to use when comes with practice and learning from mistakes. Happy baking. Thank you very much, LM. I sincerely appreciate your comment and I’m very sorry about the wrong classification. I don’t know how I missed it. Yes, I was aware of the oats and the contamination and when I was experimenting gluten-free for my kids (not because they are allergic or anything), I did buy oats which said gluten-free specifically and fortunately they didn’t react to it. Thank you once again for pointing out the mistake very politely. I will be careful the next time. Thanks for this recipe.. By cold water do you mean fridge water room temperature ? You’re welcome Anuja. Just plain tap water should be fine. Madhuram. … You are really awesome. I have become fan of your baking skills. Everything on your website is so tempting that I can resist to stare at each and every picture you have posted. It’s heavenly awesome. Loved it. Thank you so much for the compliments Ruby. Hi. I have looked on the site that you mentioned in this post and liberty don’t seem to sell a vegan royal icing. Can you please confirm it was definitely vegan, or does it contain albumen? I don’t remember the ingredients now because it’s almost 5 years since I used it. But since I have mentioned it was vegan it should be. I got it in a cake decorating supply store here in Canada. can i use maida (all purpose flour) instead of barley flour, lemon instead of apple cider vinegar, ghee instead of canola oil? Please reply soon, if possible reply today. Yes you can use all-purpose flour, and twice the amount of lemon juice for the vinegar. But I don’t know how ghee will taste in a cake because I have not tried it. How about melted butter instead? HI Madhuram, I wonder if you have a home made vegan Royal Icing recipe? I started with the Wilton 2 course. My instructor doesn’t know any vegan recipe and I cannot find vegan Royal Icong in stores here in Europe. Sorry Deepa. I don’t have one. I was lucky enough to find an egg free/vegan royal icing mix in the cake decorating store where I took the Wilton’s course. just fyi, royal icing is not vegan, it contains egg. I know it Jess. 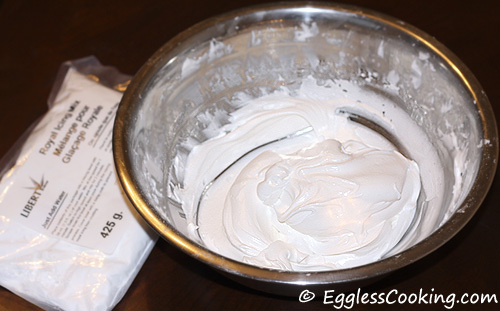 If you read my post you will see that I have mentioned that I was able to buy a vegan royal icing mix from a cake decorating store. 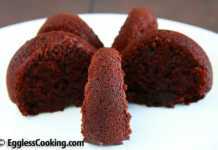 Hi,can you please share eggless(vegan) fondant recipe? Hi I haven’t tried it myself. So you will have to Google for it. where can i find whole barley flour in CA, USA? Did you try it in Whole Foods or other similar stores in your area? I think you should be able to find Bob’s Red Mill brand in the organic aisle of the regular grocery stores itself. Sorry I couldn’t reply to you any sooner (on vacation until the end of next month). It’s royal icing and I got the readymade mix in a cake decorating supplies store in Canada. 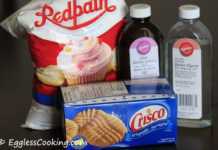 Hi there, I was wondering what ingredients you used to make that icing? And could you give me a few tips when it comes to icing a rose that’s just as pretty as yours! Thank you! Can you substitute organic apple sauce or organic agave syrup for the sugar? Usually applesauce is not used to substitute sugar but any fat in the recipe. Regarding agave syrup, I wouldn’t know until I try it myself. can’t have wheat so baking with alternative flours is new to me. Thanks for trying the recipe. Yes, it has cool completely before removing from the pan. 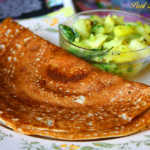 i like ur all receipe.yet i did’nt tried.but when i free i want to make.thanks to give us such a nice receipe. 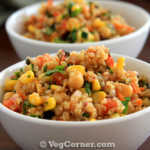 Hi Madhuram, I always keep checking your blog as I am vegetarian and my husband is allergic to eggs. You really inspire me and very soon I am going to take cake decorating lessons. Keep up the good job. You’re welcome Sharanjit. Best wishes. thankyou for replying to my post… also dow did u store the royal icing!!!!!!!!!! !as did u store in fridge or refridgerator.. as i need to use for the rest of my class… pls let me know..
You’re welcome Vani. I stored it at room temperature. I heard that royal icing keeps well quite long. But not so much the mix. I would suggest you to prepare as and when you need it for the class. I once had some excess and after a week I saw that some water stagnating at the bottom. I don’t know if it is okay to use it but I didn’t feel like using it and had to throw it away.